When the Philadelphia Flyers sacked general manager Ron Hextall several weeks ago rumors ran rampant that the former GM was let go because he wouldn’t fire head coach Dave Hakstol. Maybe it’s true, maybe not. I suppose it doesn’t really matter to Philly fans, but if Hextall took the fall for his coach he may be regretting it now since Hakstol joined him on the unemployment line on December 17th. Perhaps he saw it coming though as the Flyers had just lost their fourth game of a five-game road trip two days earlier when the lowly Vancouver Canucks drilled them 5-1 on the west coast. The 50-year-old was hired by Hextall in the spring of 2015 from the University of North Dakota and signed to a five-year, $10 million deal. He’s now been replaced by 55-year-old Scott Gordon, who was coaching the Lehigh Valley Phantoms of the American Hockey League. GM Chuck Fletcher, who took over from Hextall on Dec. 3rd, gave the media the usual speech following Hakstol’s dismissal. He praised his ex-coach’s work ethic and so on, but stated the team needed a jolt to get back on track. And as usual, the players said they felt they were to blame and needed to collectively pull up their socks. Sanheim was right when he said the team needs to play better as they allowed 5.5 goals against in the last four outings of the road trip and lost all of them. Conceding goals isn’t really anything new in the City of Brotherly Love though as the club hasn’t really iced an elite NHL goaltender for years. They appeared to have solved that problem in 2010/11 when a rookie named Sergei Bobrovsky was between the pipes in Philly. He was foolishly traded a year later and has since won a pair of Vezina Trophies with the Columbus Blue Jackets. It looks like the Flyers are intent on getting rid of anybody associated with Hextall’s reign with the franchise. After the former GM was removed the club also gave pink slips to assistant coach Gord Murphy and assistant GM Chris Pryor. The next in line was obviously Hakstol. So the question now is, have the Flyers now run out of people to fire or will there be more changes? Hakstol’s regular-season record with the Flyers doesn’t read that bad at 134-101-42. He made the playoffs in two of his three seasons, but didn’t get out of the first round on either occasion. His team was 12-15-4 when he was replaced this year and was struggling at home at just 5-7-2. The squad was expected to challenge for a playoff spot after going 42-26-14 last year for 98 points. Hextall brought former Flyer James van Riemsdyk back into the fold during the summer by signing the free-agent winger from the Toronto Maple Leafs. He was expected to help the offense, but was injured in the second game of the season and was sidelined for 16 contests. To make matters worse, goaltenders Michal Neuvirth and Brian Elliot have also had injury problems and have appeared in only 16 outings between them. Twenty-year-old Carter Hart was just called up from the Phantoms and he’ll become a club-record sixth goalie this season and it’s not even Christmas yet. In addition, their special teams have been brutal and some of their young rearguards such as Shayne Gostisbehere and Ivan Provorov are having a tough time of it. The Flyers’ goals-against average was third-worst in the NHL when Hakstol was fired at 3.74 and the offense had been held to a goal or less 10 times in their 31 games. It was also evident the team wasn’t well prepared as they also fell behind in 21 of those outings by allowing the first goal and managed to come back win just six of them. As for the new bench boss, Gordon has NHL head coaching experience with the New York Islanders from August, 2008 to November of 2010. He went 64-94-23 in New York and between 2011 and 2014 was an assistant coach with the Toronto Maple Leafs. He was in his fourth season in the AHL when he got the call from Philadelphia. Coaching changes have been relatively fast and furious this year as Hakstol becomes the fifth head coach to lose his job since October. John Stevens was sacked by the Los Angeles Kings, Joel Quenneville was let go by the Chicago Blackhawks, Mike Yeo was dismissed by the St. Louis Blues and the Edmonton Oilers fired Todd McLellan. Just to refresh your memory, there were no coaches fired last season. But even though Gordon’s in the Flyer’s driver’s seat right now there’s speculation that Quenneville will eventually take over the job. Rumors were circulating about a coaching change in Philadelphia just hours before Hakstol was fired and many of them mentioned Quenneville as his replacement. It turns out the coaching change was true, but so far the rest of it is still just conjecture. 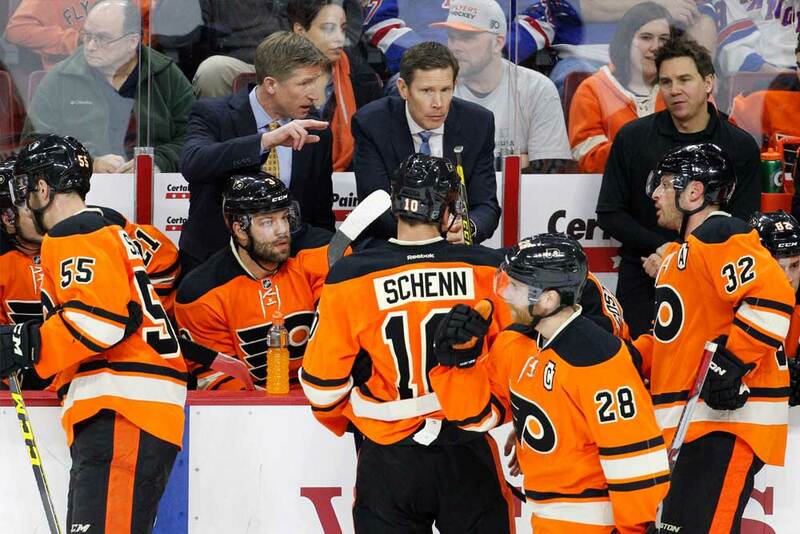 No matter who’s behind the bench though, the Flyers need to get their collective act together and pick up the pieces in a hurry if they hope to challenge for a playoff spot this season.